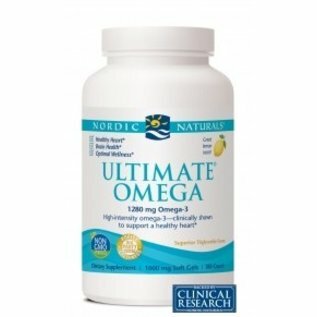 The #1-selling omega-3 in the U.S., Ultimate Omega® offers concentrated levels of omega-3s for high-intensity essential fatty acid support. 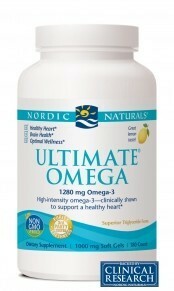 Ultimate Omega helps optimize immune function, supports brain health, and has been clinically shown to support a healthy heart. Every batch of Nordic Naturals algae oils is tested by a third-party certified lab for environmental toxins, including heavy metals. All algae oils are in the triglyceride form and surpass the strictest international standards for purity and freshness. Suggested Use: Two soft gels daily, with food, or as directed by your health care professional or pharmacist. For ultimate support, take two soft gels with food twice daily. Free Of GMOs, gluten, milk deriviatives or artificial color or flavors. Consult with your physician before using this product if you are pregnant, diabetic or allergic to iodine. Do not take this product if you are using blood thinners or anticipate surgery.